Propranolol is a health system. Propranolol is available in generic form. Propranolol is also used to lower portal vein pressure in portal hypertension and prevent esophageal variceal bleeding and ascites. Propranolol is often used by musicians and other performers to prevent stage fright. It has been taken by surgeons to reduce their own innate hand tremors during surgery. Propranolol is being investigated as a potential treatment for post-traumatic stress disorder(PTSD). 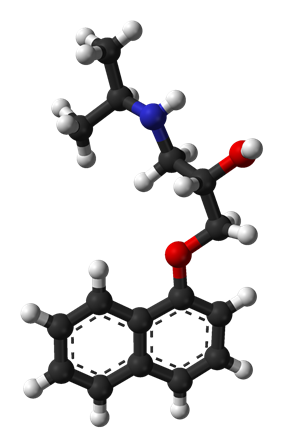 Propranolol works to inhibit the actions of norepinephrine, a neurotransmitter that enhances memory consolidation. Individuals given propranolol immediately after trauma experienced fewer stress-related symptoms and lower rates of PTSD than respective control groups who did not receive the drug. Propranolol reduces the effects of nightmare-related cardiac activity by keeping sinus rhythm low during nightmares, as a higher pulse and increased adrenaline are associated with severe nightmares. However, results remain inconclusive as to the success of propranolol in treatment of PTSD, including nightmares experienced by those with PTSD. Propranolol maybe used to treat severe infantile hemangiomas (IHs) began to emerge. This treatment shows promise as being superior to corticosteroids when treating IHs. Extensive clinical case evidence and a small controlled trial support its efficacy. Volunteers given the beta blocker propranolol scored lower on a range of psychological tests designed to reveal any racist attitudes than a group who took a placebo. The amygdala is involved in processing emotion, including fear, and has been shown to be inhibited by propranolol. Due to the high penetration across the blood-brain barrier, lipophilic beta blockers such as propranolol and metoprolol are more likely than other less lipophilic beta blockers to cause sleep disturbances such as insomnia and vivid dreams and nightmares. Adverse drug reactions (ADRs) associated with propranolol therapy are similar to other lipophilic beta blockers. Most beta-blocking agents appear in the milk of lactating women. However, propranolol is highly bound to proteins in the bloodstream and is distributed into breast milk at very low levels. These low levels are not expected to pose any risk to the breastfeeding infant, and the American Academy of Pediatrics considers propranolol therapy "generally compatible with breastfeeding". Salbutamol, levosalbutamol, formoterol, salmeterol, etc. Fluvoxamine slows down the metabolism of propranolol significantly, leading to increased blood levels of propranolol. Propranolol is rapidly and completely absorbed, with peak plasma levels achieved about 1–3 hours after ingestion. Coadministration with food appears to enhance bioavailability. Despite complete absorption, propranolol has a variable bioavailability due to extensive first-pass metabolism. Hepatic impairment therefore increases its bioavailability. The main metabolite 4-hydroxypropranolol, with a longer half-life (5.2–7.5 hours) than the parent compound (3–4 hours), is also pharmacologically active. Propranolol is a nonselective beta blocker; that is, it blocks the action of epinephrine and norepinephrine on both β1- and β2-adrenergic receptors. It has little intrinsic sympathomimetic activity, but has strong membrane stabilizing activity (only at high blood concentrations, e.g. overdosage). Propranolol has inhibitory effects on the norepinephrine transporter and/or stimulates norepinephrine release (the concentration of norepinephrine is increased in the synapse). Since propranolol blocks β-adrenoceptors, the increase in synaptic norepinephrine only results in α-adrenergic activation, with the α1-adrenoceptor being particularly important for effects observed in animal models. Therefore, it can be looked upon as an indirect α1 agonist, as well as a β antagonist. Probably owing to the effect at the α1-adrenoceptor, the racemic and the individual enantiomers of propranolol have been shown to substitute for cocaine in rats, with the most potent enantiomer being S-(–)-propranolol. In addition, some evidence suggests propranolol may function as a partial agonist at one or more serotonin receptors (possibly 5-HT1B). Both enantiomers of the drug have a local anesthetic (topical) effect, which is normally mediated by blockade of voltage-gated sodium channels. Few studies have demonstrated propranolol's ability to block cardiac, neuronal, and skeletal voltage-gated sodium channels, accounting for its known "membrane stabilizing effect" and antiarrhythmic and other central nervous system effects. British scientist James W. Black developed propranolol in the 1960s. In 1988, he was awarded the Nobel Prize in Medicine for this discovery. Propranolol was derived from the early β-adrenergic antagonists dichloroisoprenaline and pronethalol. The key structural modification, which was carried through to essentially all subsequent beta blockers, was the insertion of an oxymethylene group into the aryl ethanolamine structure of pronethalol, thus greatly increasing the potency of the compound. This also apparently eliminated the carcinogenicity found with pronethalol in animal models. Newer, more cardio-selective beta blockers (such as nebivolol, carvedilol, or metoprolol) are now used in the treatment of hypertension. In a 1987 study by the International Conference of Symphony and Opera Musicians, 27% of interviewed members admitted to using beta blockers such as propranolol for musical performances. For about 10-16% of performers, their degree of stage fright is considered pathological. Propranolol is used by musicians, actors, and public speakers for its ability to treat anxiety symptoms activated by the sympathetic nervous system. This can be seen as giving participating individuals an unfair advantage, especially in competitions, akin to the use of performance-enhancing drugs in athletes. Propranolol is marketed in India under brand names such as Ciplar and Ciplar LA by Cipla, also other brands from AstraZeneca and Wyeth under brand names Inderal, Inderal LA, Avlocardyl, Deralin, Dociton, Inderalici, InnoPran XL, Sumial, Anaprilinum, and Bedranol SR (Sandoz). Hemangeol, a 4.28 mg/mL solution of propranolol, is indicated for the treatment of proliferating infantile hemangioma. In 2015, a trial in women with epithelial ovarian cancer showed that the intake of a nonselective β-blocker was associated with a longer survival compared to a β1-selective β-blocker or no β-blocker. Currently, an interventional study is being conducted at the M.D. Anderson Cancer Center to access the feasibility of a nonselective β-blocker plus standard chemotherapy (paclitaxel and carboplatin or possibly docetaxel) to treat ovarian cancer. ^ a b c d e f g h "Propranolol hydrochloride". Monograph. The American Society of Health-System Pharmacists. Retrieved 1 January 2015. ^ a b Black JW, Crowther AF, Shanks RG, Smith LH, Dornhorst AC (1964). "A new adrenergic betareceptor antagonist". ^ Shields, Kevin G.; Peter J. Goadsby (January 2005). "Propranolol modulates trigeminovascular responses in thalamic ventroposteromedial nucleus: a role in migraine?". ^ Eadie, M.; J. H. Tyrer (1985). The Biochemistry of Migraine. New York: Springer. p. 148. ^ Kornischka J, Cordes J, Agelink MW (April 2007). "[40 years beta-adrenoceptor blockers in psychiatry]". Fortschritte Der Neurologie-Psychiatrie (in German) 75 (4): 199–210. ^ Vieweg V, Pandurangi A, Levenson J, Silverman J (1994). "The consulting psychiatrist and the polydipsia-hyponatremia syndrome in schizophrenia". International Journal of Psychiatry in Medicine 24 (4): 275–303. ^ Kishi Y, Kurosawa H, Endo S (1998). 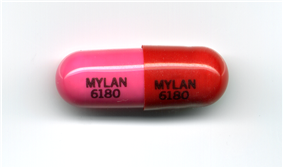 "Is propranolol effective in primary polydipsia?". International Journal of Psychiatry in Medicine 28 (3): 315–25. ^ Kramer MS, Gorkin R, DiJohnson C (1989). "Treatment of neuroleptic-induced akathisia with propranolol: a controlled replication study". The Hillside Journal of Clinical Psychiatry 11 (2): 107–19. ^ Thibaut F, Colonna L (1993). "[Anti-aggressive effect of beta-blockers]". L'Encéphale (in French) 19 (3): 263–7. ^ Sheetal Ladva (28 June 2006). "NICE and BHS launch updated hypertension guideline". ^ Paul A. James, MD; et al. (5 February 2014). "2014 Evidence-Based Guideline for the Management of High Blood Pressure in Adults". ^ Elman MJ, Sugar J, Fiscella R, et al. (1998). "The effect of propranolol versus placebo on resident surgical performance". Transactions of the American Ophthalmological Society 96: 283–91; discussion 291–4. ^ "Doctors test a drug to ease traumatic memories - Mental Health - MSNBC.com". Retrieved 30 June 2007. ^ Brunet A, Orr SP, Tremblay J, Robertson K, Nader K, Pitman RK (May 2008). "Effect of post-retrieval propranolol on psychophysiologic responding during subsequent script-driven traumatic imagery in post-traumatic stress disorder". Journal of Psychiatric Research 42 (6): 503–6. ^ Vaiva, G.; Ducrocq, F.; Jezekiel, K.; Averland, B.; Lestavel, P.; Brunet, A.; Marmar, C.R. (2003). "Immediate treatment with propranolol decreases post-traumatic stress disorder two months after trauma". Biological Psychiatry 54: 947–949. ^ Hall, Wayne; Carter, Adrian (2007). "Debunking Alarmist Objections to the Pharmacological Prevention of PTSD". American Journal of Bioethics 7 (9): 23–25. ^ Hogeling, M. (2012). "Propranolol for Infantile Hemangiomas: A Review". Current Dermatology Reports: Online-first. ^ Sheetal Ladva (15 March 2012). "Drug 'reduces implicit racial bias,' study suggests". ^ Cruickshank JM (2010). "Beta-blockers and heart failure". Indian Heart J 62 (2): 101–10. ^ a b Sweetman, Sean C., ed. (2009). "Cardiovascular Drugs". ^ [No authors listed] (September 2001). "Transfer of drugs and other chemicals into human milk". Pediatrics 108 (3): 776–89. ^ Spencer JP, Gonzalez LS, Barnhart DJ (July 2001). "Medications in the breast-feeding mother". Am Fam Physician 64 (1): 119–26. ^ van Harten J (1995). "Overview of the pharmacokinetics of fluvoxamine". Clinical Pharmacokinetics 29 (Suppl 1): 1–9. ^ Rang, Humphrey P. (2011). Rang & Dale's pharmacology (7th ed.). Edinburgh: Churchill Livingstone. p. 106. ^ Young R, Glennon RA (April 2009). "S(-)Propranolol as a discriminative stimulus and its comparison to the stimulus effects of cocaine in rats". Psychopharmacology (Berl.) 203 (2): 369–82. ^ Wang D. W., Mistry A. M., Kahlig K. M., Kearney J. A., Xiang J., George A. L. Jr (2010). "Propranolol blocks cardiac and neuronal voltage-gated sodium channels". Front. Pharmacol 1: 144. ^ Bankston J. R., Kass R. S. (2010). "Molecular determinants of local anesthetic action of beta-blocking drugs: implications for therapeutic management of long QT syndrome variant 3". J. Mol. Cell. Cardiol 48: 246–253. ^ Desaphy J. F., Pierno S., De Luca A., Didonna P., Camerino D. C. (2003). "Different ability of clenbuterol and salbutamol to block sodium channels predicts their therapeutic use in muscle excitability disorders". Mol. Pharmacol 63 (3): 659–670. ^ a b Fishbein M, Middlestadt SE, Ottati V, Straus S, Ellis A (1988). "Medical problems among ICSOM musicians: overview of a national survey". Med Probl Perform Artist 3: 1–8. ^ Steptoe A, Malik F, Pay C, Pearson P, Price C, Win Z (1995). "The impact of stage fright on student actors". Br J Psychol 86: 27–39. ^ Alan H. Lockwood (1989). "Medical Problems of Musicians". NEJM 320 (4): 221–227. ^ Thomas H. Murray (1983). "The Coercive Power of Drugs in Sports". Hastings Center Report 13 (4): 24–30. ^ "Hemangeol - Food and Drug Administration" (PDF). 1 March 2014. Retrieved 23 March 2015. ^ A.K. Sood, J.L.Watkins, P.H. Thaker (2015). "Clinical impact of selective and nonselective beta-blockers on survival in patients with ovarian cancer". Cancer: Online-first. ^ https://clinicaltrials.gov/show/NCT01504126. Retrieved 17 October 2015. Stapleton MP (1997). "Sir James Black and propranolol. The role of the basic sciences in the history of cardiovascular pharmacology". Texas Heart Institute Journal 24 (4): 336–42.